Brittany Nixon and Roni Marsh from S.O.M.E. attended our first "Trap 'N Paint" event at the Creative Saints Loft on Thursday, July 26th. There were 11 participants in attendance and we were able to raise a total of $100.00 in proceeds for the organization. S.O.M.E. is a interfaith, community based organization that serves about 10,000 people each year who have been impacted by poverty, homelessness and mental illness and addiction. Their approach to serving communities is more of a holistic approach. They have a long-standing history in the D.C. community as being first responders in the fights against poverty and homelessness. They also provide continual services that are designed to lift their clients out of poverty to achieve long-term stability. On Sunday, July 15th, the Artbae Society held their first "Paint & Watch" event at the Creative Saints Loft. The "Watch Party" concept is an initiative of Zion Church in Landover, MD to promote watching their worship services online from anywhere in the country. This particular event was held at the Loft and was geared towards raising proceeds for the church's annual Back to School Backpack Drive. There were 13 participants in attendance and we were able to raise a total of $74.00 in proceeds which would fully provide a total of 3 children with school supplies. The below is a transcript from CEO Cary Michael with Danielle Stradford, Communications Coordinator at Zion Church. 1) How did you first get connected to Zion Church and how long have you been attending? I first got connected to Zion Church when I moved to the area in 2012 through my fellow FAMU alum and brother in Christ Alsean Bryant. Since the first day I visited Zion, I ended my "church hop" and have been attending Zion ever since, and became an official member in December 2013. 2) Has Zion Church had an impact on your life? And if so, in what ways? Zion Church has taught me the importance of serving and truly living for Christ. Not only is it important to live a life that is a reflection of God's character, but to also treat everyone else with love, kindness and respect. 3) Do you serve here at Zion? If so, where do you serve and why? I currently serve on the Frontline Ministry and will be the POC person for the 11:30am First Sunday Services starting August 2018. I serve because it is my duty to God to utilize my gifts of patience, politeness and good 'ol southern hospitality in the capacity of a greeter for the Welcome Team to get people excited about praise and worship as the enter the church. 4) Why choose to support the backpack drive? I believe that because our children are our future, it is important that they are properly equipped with all the supplies they need to be successful, particularly for youth who are from the many underprivileged communities within the DMV. Because of this, I am in support of anything that will aid in the betterment of our youth in these communities. 5) Did you support the drive in the past? If yes, why step it up to this level (watch party)? I supported the annual Backpack Drive event last year by providing a College backpack, helping with the event setup and by distributing backpacks. After witnessing a multitude of large families (single mothers with 2+ kids) receive backpacks and to see the joy in the parents' and children's faces, I realized that it was necessary to step it up and make more people aware of this initiative. The more people we have in support of the Backpack drive, the more joy we can create and the easier it will be for families to afford to send their children to schools. 6) What was the inspiration behind this event? Because Pastor Battle is promoting the Zion Anywhere Watch party experience, I decided to combine my artistic experience with this concept to create something that is altogether unique, fun and informative, all for a good cause! 7) What were you looking to accomplish by hosting this event? While the ultimate goal was to raise money for the backpack drive, I also wanted to bring people together who may not have been familiar with Zion church to experience a service in a non-traditional environment, while painting and enjoying light refreshments. 8) Was your goal accomplished and what lessons were learned from this experience? I believe my goal was accomplished, as we were able to donate a portion of the total proceeds towards the Backpack event, while the remaining proceeds went towards the art supplies used during the painting session. 9) As a millennial what do you think of the idea of gathering with others and looking at a sermon in the form of a Watch Party? I think the idea is genius! While, I am an advocate for routine physical church attendance (to be a vessel for Christ to bless others and to also be empowered by the company of other believers), ANY outlet to introduce people to Christ and to allow a body of believers to praise and worship together should not be frowned upon. 10) What words of encouragement would you have for someone who is thinking about getting involved with Zion’s 2018 backpack drive but unsure? Know that we are all blessed to be a blessing, and that YOUR blessings will come in the midst of you serving God and serving others. 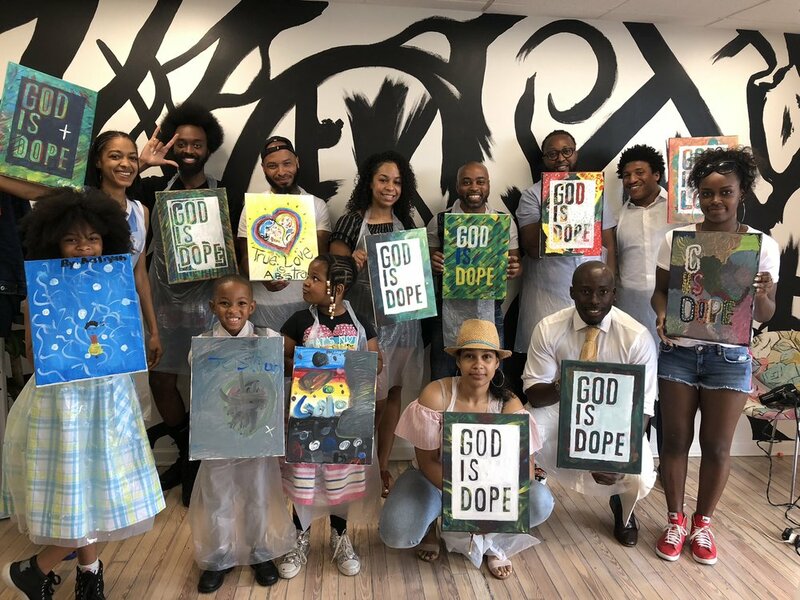 On Thursday, August 23rd, @artbaeonline partnered with @marcusaware’s “Ware Warriors” to host a Comics-themed #TrapnPaint to raise proceeds for the @leukemialymphomasociety. Marcus successfully completed his last chemotherapy treatment the previous weekend, but began his celebration by painting for a purpose @creativesaintsloft! We are proud of Marcus for kicking cancer’s @$$ like a superhero, and it was a pleasure to donate $330 to support cancer research! For those who would like to support his mission to wipe out blood cancer, please consider making a donation by clicking the fundraiser link below - Way to Go Marcus!!! Special shout-out to the @kennedycenter for allowing @artbaeonlinethe opportunity to showcase our talent by pre-tagging the “Tag Tower” during the 17th annual “Page-to-Stage New Play Festival”! It’s always a pleasure to provide a creative outlet to people of all walks of life! Many thanks to the super talented @sptheplug for the dope DC-inspired illustrations and cheers to many more collabs to come!